This is my first review, so I hope you like it. 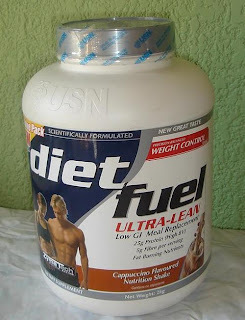 I have USN diet fuel mostly as a meal replacement for breakfast. I struggle to get food in to my body in the mornings, I have always been like that, and it is funny, seeing that I am about 25kg's overweight. I just don't feel lik eating in the morning. I prefer the Chocolate flavour, it tastes a lot like a thick milkshake, although a bit more powdery. As a meal replacement, this fills me up big time. 1 serving is about 3 heaped scoops with 300 -350ml cold water or skimmed milk. I prefer mixing it with water, as it seems to mix thicker with milk, plus, the milk is just extra kilojoules to get rid of later. The vanilla is also a nice option, as you can then add some peanut butter or fruit to give it flavour. It is stacked with vitamins & minerals, and off course, protein heavy. USN is a trusted South African company who sells products across the globe these days, and this must be one of their top 3 products. As a weight loss tool, I would highly recommend this, it lifts your metabolism, and keeps you full, plus, I definitely have more energy during the day when I had one of these for breakfast. Thanks for a great review of a wonderful product that I myself endorse to the highest order. USN diet fuel is the way to go. would you say replacing meals with these shakes helped you loose weight? Hi Christine, yes, 100% yes.